I was negotiating a contract for a large company during my first or second year of practice. There was a lot of back and forth between the lawyer on the other side and me with contract drafts being sent both ways over a period of weeks. Suddenly, I realized that I’d completely lost track of which draft was current and that I’d made revisions to the wrong draft some point along the way, creating a confusing mash-up of old, intermediate, and new contract language. I had to call opposing counsel for help — a bit embarrassing, to be sure. Contract drafts breed faster than rabbits in the spring. Here’s a typical contracting scenario: One party sends a contract to the other party. The other party wants to negotiate changes to the contract and either sends back a revised document containing suggested changes or sends back a list of proposed changes with explanations, or both. The first party then either sends back a revised contract that includes some of the other party’s suggested changes or refuses to make any changes. The process is repeated until a final draft is agreed upon, circulated, and signed. A single person on each side of the deal needs to be responsible for maintaining the official version of the contract and making sure all appropriate changes are incorporated into it. And, ultimately, one side or the other will be responsible for producing the official version of the contract that’s signed by the parties. If you use a document management system, you can save documents as numbered versions of the same document. If you don’t use a document management system, you can track versions by including the version number in the document’s name (e.g., “Asset Purchase Agreement v.1”). Either way, you should save versions of the document separately to keep track of how the document changes over time and to run comparisons, which I discuss below. If you read through a contract and make a couple of minor changes, should the changed document be a new version? If a senior associate requests a junior associate to make changes, should the revised document be a new version? What about when a firm’s client requests changes before the contract is first sent to the other side? If all of these are separate versions, you might be on version 30 before you send the “initial” draft to the other side. You should decide what constitutes a new version and consistently save documents as new versions according to the system you adopt. Should you manually type suggested revisions into the official version of the contract, or is it better to accept a document received from the other side as the new official version? If you receive bullet-point comments from the opposing side, or if all the comments you receive are in the form of handwritten notes or other marginal notes, your only choice will be to incorporate changes to the contract by manually revising the document. But what if you receive a fresh draft in Word format with all the comments nicely incorporated into the text in the form of revised language? Does that draft then become your master version? The answer depends on the circumstances, but as a general rule, if you control the official document, all changes should be made directly to that document by you or your own people. That might make for what seems like unnecessary typing, but it’s the best practice because it avoids incorporating changes into the official document that you didn’t mean to include. It also ensures that corrupted text, weird formatting, and other such aggravations don’t get incorporated into the official document. That said, it’s common in dealing with commercial contracts (as opposed to documents in a mergers and acquisitions context) for each party to work on the same Word document and track their changes using Word’s Track Changes feature. In this method, one side produces the initial draft, the other side makes revisions to the document, tracking the revisions with Track Changes, and the first side then accepts, rejects, and further revises the agreement. The process is repeated until all changes have been accepted and a final version has been agreed upon. Regardless of what method you use to update the official document as negotiations progress, you should always run an electronic comparison when you receive a draft from the other side. An electronic comparison shows you what changes have been made to a document by comparing the draft that comes back from the other side against the draft you sent them. Whether you use Word’s document comparison feature or a stand-alone application like Workshare Compare, it’s important to know what changes have been made to the document. And Track Changes isn’t a reliable guide. These are a few of my thoughts about keeping track of contract versions. What do you think? Good tips, Brian. Concerning #2, for probably 15 years now I’ve found it useful to put the date and time in the file name of the Word document AND in a running header on every page. EXAMPLE FILE NAME: “Hatfield-McCoy Reconciliation Agreement draft 2013-11-04 1800 CST.docx” — note the use of military-style 24-hour time to eliminate the need for “a.m.” or “p.m.,” also the time zone CST. EXAMPLE RUNNING HEADER: “Draft 2013-11-04 18:00 CST” — this should be manually typed in, not inserted as a Word date-field code, because you don’t want Word to automatically change the header’s date and time every time you save or print the document. D.C. I notice that you denote drafts as “drafts” in the documents themselves. This is a good signal that the parties haven’t yet reached final agreement. (Noting that fact in the email or letter you use to transmit the draft is helpful, also.) 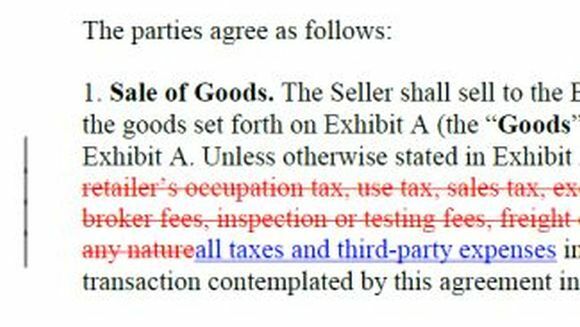 Of course, sometimes people sign documents with “draft” at the top (as well as documents containing redlined Track Changes). I once read about a lawyer’s numbering scheme of using letters to refer to internal versions of the type you described agmt v1A.doc, agmt v1B.doc, etc., and then using numbers to identify the versions exchanged with the other side agmt v1.doc, agmt v2.doc. I date each draft which almost always eliminates the need to add explicit version numbers except when multiple edits are made on the same day. It also aids in sorting and searching as well as gives a user implied information about the staleness of the version. I can’t tell from v3 whether it’s current, but I should know that 3-Oct-13 is awfully old to be the current version. As you said, meeting the goal is the ultimate requirement; there are lots of paths to get there. Rick: I like using dates, also. With this draft-naming system, do you use document management software or save document versions to file folders? All the document management applications I’m aware of allow you to save documents in multiple versions and include notes about each version. Some also allow you to save minor (draft) versions (e.g., version 1.2) as well as major versions, which can help you deal with multiple versions resulting from internal back-and-forth versus a draft that is sent to the other side. In addition to dating all the documents and including a little description in the header, I have found it useful to change the version number only when it goes out to the other side for a review – this also represents the stance taken by a party and is useful to refer to during negotiations. Another useful tip is to mark all internal drafts as WIP (work in progress) drafts, This provides a whole lot of relief from trudging through the files. Very interesting post, thank you for shedding light on the this aspect of contract drafting. As a translator, it sometimes happens that I start working on the translation of a contract and receive an edited version, either during the process or after I have completed the project. It now makes sense why this happens. There is software out there that automates contract changes, making it much easier to manage the negotiation process.